This morning, as I arrived at church, I updated my Facebook status to say this: “Scott wonders how many if his Episcopal Church colleagues will celebrate ‘Christ the King’ today in error.” I was being a little snarky, but I had no idea what volume of reaction this would provoke. My UK friends were puzzled. They wondered, what’s the problem? While the Feast of Christ the King is on recent calendars in the Church of England, it is not a feast day the Episcopal Church keeps. My standard is the Book of Common Prayer. Check it out. This Sunday is “The Last Sunday after Pentecost.” The readings are nearly identical with those of Christians who keep the feast of Christ the King. So who cares it we call it Christ the King or not? I think it matters, for a couple of reasons. We need to know a bit about the history of the feast day. This is not an ancient feast day of the undivided church. It was created by Pope Pius XI in 1925 as an overt response to two threats to the Roman Catholic church: secularism and Protestantism. Now, I don’t mind celebrating recent feast days. And I don’t mind celebrating days that were invented by our Romish friends. I don’t even mind celebrating festivals that are implicit responses to secularism. I can even tolerate a reclaimed feast that began its life as a kind of veiled response to the church of which I am a member. No, these are not my problems with this feast day. My problem is simple: I have taken an oath to be loyal to the doctrine, discipline, and worship of the Episcopal Church. In particular, this means that I must use and accept the Book of Common Prayer, not just when it’s convenient or when I like it. As a Deputy, I would gladly vote to change the title of the end of our church year. But until this happens, the congregations I serve will keep the feast day as it is titled in our common prayers. To be sure, we really whooped it up today. Our service began with a Procession. We traipsed all around the nave, with a Station at the Rood. We sang glorious hymns praising Christ’s kingship. Our bulletin clipart bore the caption “Christ the King” because that’s a title which accords with scripture and tradition. But we kept the day as it is prescribed in the prayer book. It’s not that I mind creativity. Our Sunday evening service is wildly creative. But it’s not a principal service. The principal service must use the liturgies authorized by General Convention. I understand that local practice is what eventually becomes settled canon. However, I’ve seen too many clergy who imagine that they have the ability or the authority to rewrite Eucharistic prayers, rubrics, or canons. It’s a universal affliction of left and right. It’s a very American entitlement-oriented mentality. And it’s tearing apart our church. There’s another peculiar issue with this feast day in the parish I serve. As the parish is called Christ Church, the Feast of Title used to be kept on this day. Since this parish was founded in 1834 (about 90 years before the feast of Christ the King existed), it can’t possibly be the real feast of title. So now we keep our feast of title on the Feast of the Transfiguration. That lets us whoop it up in the summer, right when we need a good excuse for a liturgical blow-out. And it’s a feast day that is in our calendar. Lastly, I think it’s also a problem that many of my colleagues didn’t know this feast wasn’t in our Calendar (or Kalendar, if you prefer). How could this be? Well, unfortunately, materials that emanate from 815 frequently use the title “Christ the King.” How can local clergy get it right when 815 gets it wrong? Indeed. Again, I’ll support an effort to change our calendar, but until then, we’re following the prayer book. Despite whatever might come from Church Publishing or diocesan offices. For the record, the phrase “Christ the King” appears only one time in General Convention resolutions from 1976 to the present. Resolution 2006-D022 originally called for an observance on the “Feast of Christ the King.” In the House of Bishops, the Bishop of Milwaukee moved an amendment to correct the resolution to read “Last Sunday after Pentecost” and that’s what GC passed. Methinks you’re being a Prayer Book fundamentalist on this one, Scott. I agree with you that far too many clergy are “creative” with the liturgy in ways that they shouldn’t be. But, really, how serious a violation of the doctrine, discipline, and worship of the Episcopal Church is it to put the name of a day on a bulletin cover that is not explicitly authorized by the Prayer Book Calendar but *is* clearly authorized by the Universal Church (in the West at least) as well as by decades of local custom? And also when the clear intent of the selection of Lectionary readings *is* to celebrate the Feast of Christ the King in all but name? And when the celebration of Christ the King by any other name is really still the celebration of Christ of King? In any case, at S. Stephen’s we typically style the day “The Last Sunday after Pentecost: Christ the King,” which honors both its Prayer Book designation and its customary designation. Anglo-Catholics such as myself admittedly *do* tend to play a bit fast and loose with the rubrics on occasion, but never in the service of our own creativity or clever ideas, but rather always out of a sense of loyalty to the authority of a higher tradition that certainly *includes* the doctrine, discipline, and worship of the Episcopal Church but is not necessarily limited to it. That is very different (in intent anyway) from making the liturgy a vehicle of one’s own personal self-expression. A couple of factual notes / questions: I have been led to believe that Christ the King was Pius XI’s counter to the absolute claims of totalitarian fascism and communism, not just secularism (and I haven’t heard that it had anything to do with opposing Protestantism but maybe you know something I don’t about that). Also, it used to be the last Sunday in October (which is when my friends who use the old Calendar keep it), and was only changed to the last Sunday after Pentecost sometime in the 1960s when the current Roman calendar was adopted. Scott, I find myself agreeing wholeheartedly with your underlying point. In fact, it needs to be veritably shouted from the rooftops. And I honor the spirit of discipline which restrains you from putting the words “Christ the King” on your bulletin cover. My own parallel act of submission is to respect the fact that Eucharistic Prayer A does not allow the celebrant to interpolate the names of particular saints where “all the saints” are mentioned. Hence, on weekday Masses commemorating a saint, I use Prayer B, which does make such an allowance. Now, I have to ponder why my act of submission makes sense to me and yours strikes me as straining gnats. Does the mere absence of particular words on the bulletin cover mean that your parish did not celebrate the feast of Christ the King, even as you heard readings, sang hymns, and (presumably) preached a sermon, all of which would have been appropriate in a parish that *did* celebrate it? 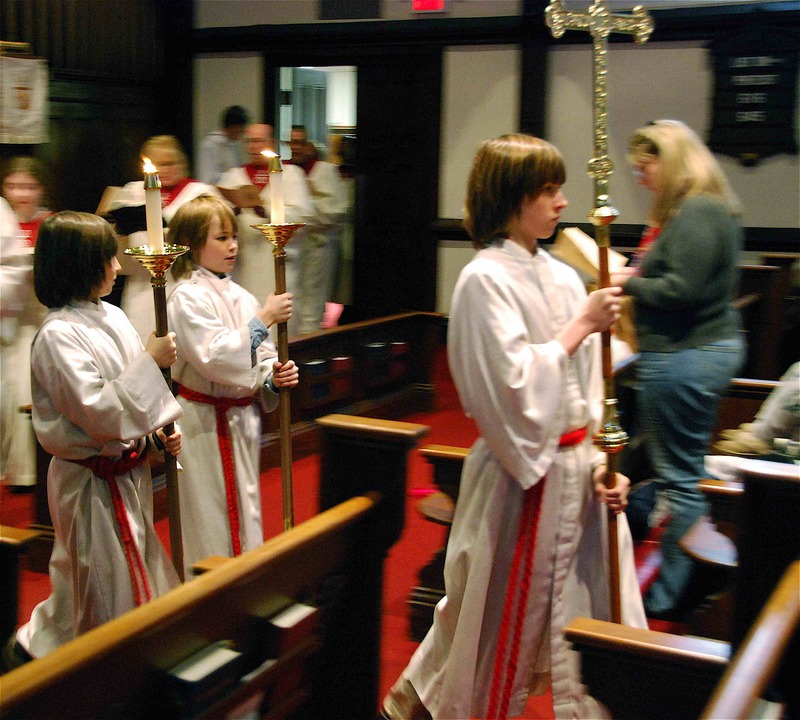 Out of curiosity, what color vestments did you use? John, I am no doubt guilty of a fundamentalist streak. Your solution is a fine one, I think (“The Last Sunday after Pentecost: Christ the King”). I think the reason this one gets to me is twofold. First, it irritates me that the materials that come from 815 don’t match what our prayer book says. Second, my own parish was celebrating its Feast of Title on this imported holiday. I guess I can live with someone adding a subtitle to a feast, but to celebrate a titular feast seems…wrong. My general sense is that people right and left like to come up with their own justifications for prayer book “enhancements” whilst condemning those of the other side. So my posture of late has been to strictly (and I mean strictly) follow rubrics. Partly it’s because I rarely see a rubrically compliant Eucharist on a Sunday morning, and I was curious if it could be done. Yes, it can. Someday, I’d be interested in serious conversation about how we can decide to honor our vows, uphold the catholic faith, and yet maintain local preference. It seems that the balance has tilted wwaaaayyyy toward the latter. Hence my extremist reaction. I assume you folk have something similar down south. Anyway, the chaplain of our ACPO was a charming old archdeacon who offered us this bit of advice. You will find, he told us, that whenever you go to a parish and ask about how they do the liturgy, the people will tell you, “straight Prayer Book.” And they mean it. But you need to understand that “straight Prayer Book” does not mean the same thing in any two parishes of the Anglican Communion. So, during the liturgy, one of two things will occur. Either you will begin to do something and the people will have no idea what you’re doing, or the people will begin to do something and you will have no idea what they’re doing. If you’re the one doing, just muddle through and you’ll get back on track. If it’s the people doing, just walk once around tha altar and, by the time you get back to where you started, they’ll have finished. The upshot is that I’m not at all convinced that there is any sort of “right” way to do any part of the liturgy – up to and including the naming of days. There are surely things that would be “beyond the pale,” but I suspect that we could argue for years over which things those would be. At College, Fr. Buchner used to conduct an informal, non-credit yet nonetheless required tutorial which was referred to as Priestcraft. He told us that he would show us A way of conducting the service, and he would discuss some of the alternatives. The result was that we came out of College with a reasonably clear sense of what needed doing. One useful piece of advice he proffered was to have a trusted person keep a watch out for any eccentricities creeping into how one did the service. Malcolm, I’ll freely admit that I’m being a bit of a bore by being cranky about the title of a feast. My point is that it’s the thin of a a wedge that’s really, really problematic in ECUSA. I’m not talking about deciding which manual acts to do or which way to face. I’m not talking about what gets chanting and where things go on the Altar. We have priests who feel that they can edit Eucharistic prayers. We have parishes which don’t say the Nicene Creed because it’s off-putting. We have priests who decide that rebrics are suggestions, at best. Oh, and I’m not talking about places like St. Gregory Nyssen on San Francisco, where their local variations are formed out of much thoughtfulness and scholarly work. I’m not talking about a parish that finds itself in a stream that’s more Eastern or Romish in its outlook. I’m talking about places where the priest’s whims are to engage in wholesale disregard of the prayer book. Like the Feast of Christ the King (which itself was reactionary), my current inclinations toward fundamentalism (which I’ll accept as an endearing compliment) are a reaction against individualistic approaches to liturgy that defy any catholic sensibility. So there. So I think your ACPO experience is something I’d agree with. Presumably your mentors didn’t tell you that you were free to jettison the liturgies of the church if you felt like it. Two key factors in interpretation of the rubrics are (a) respect for local custom and sensibilities — one doesn’t want ever to do something offensive to one’s congregation except for overriding reasons of extreme necessity; and (b) obedience to the bishop (or resident ecclesiastical authority as the case may be). The point is that as presbyters we are under hierarchical authority, which to some extent frees us from the burden of making all these decisions completely on our own. Everything I do is with the (at least tacit) permission of the bishop; and if I were to receive an episcopal directive to knock off some particular liturgical or ceremonial practice not explicitly authorized by the rubrics, I would comply (maybe reluctantly but) immediately. methinks you are a selective BCP-literalist! Er, Peter, look on BCP 1979: p. 33 (bottom of page), p. 194, p. 246, pp. 836-7, and p. 925. Hope this helps you in your planning. Cheers, J.
I can be every bit as sticky when it suits, of course. And I agree that there isn’t really space for editing at whim. It is curious, though, to see what constittes a sticking point. Fred would nod a little bow and we’d be off. I stand corrected on the Thanksgiving piece. Thanks. Did you find anything about the climate change piece? I read your post this morning, and intended to respond much like the good rector of St. Stephen’s. I agree totally with your underlying point. There are too many clergy playing cutesy with all aspects of the life of the Church, especially the liturgy, but I think Christ the King is of a different order. Even though it is an innovation and an example of creeping popery, it is a piece of the tradition, consistent with the focus of the day. I hope it makes it into our list of feasts in an official way. I like the story of Malcom and the bishop. Here in LA, there is a “house Eucharist” at the cathedral center on Thursday noon, which is the time most of the workers in the building can gather together. the celebrant is normally a priest. often one of the bishops is present, in the congregation in civvies. somehow it simply works, and works cleanly and well, that that bishop–from wherever he’s standang, whatever he’s wearing–would say the absolution and the blessing, as the rubrics appoint. it is gracious, simple, unfussy, and a clearly understood nod. i agree with the point of the main post, of course. my views on this topic are on record! I think you know how I feel. I was lucky to remember it was Sunday. your piece and the comments are very helpful. Is the RCL lectionary not an alternative formulary to your BCP?